The test scripts and libraries are written using (as much as possible) the Page Object design pattern. This model gives us the capability of abstracting specific functions in a class and exposed as a method that can be accessed by the test scripts using wrapped function calls to the Selenium Perl Client Driver. All html objects that the user (i.e. Test Script developer) will access are also abstracted and mapped to human readable names. This is a simple process that maps Selenium element names and locator strategy, for example the human readable “menu” “database_setup” will map to “mnuMain_DXI5_T” “ID” (element name, locator strategy) respectively. As shown on the below diagram, we are using Selenium Grid to distribute our tests to different environments. Grid by itself does not support choosing a specific platform (i.e. you can tell it to use VISTA but you cannot specify architecture (e.g. x64), for example); we forked and modified the original code to support this functionality. Basically we are using a capability called applicationName to pinpoint the exact node we want to execute our test against. 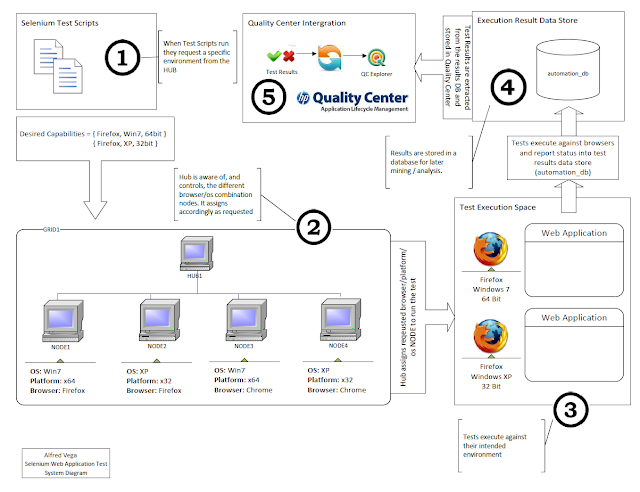 As shown on the below diagram, we are using Selenium Grid to distribute our tests to different environments. Grid by itself does not support choosing a specific platform (i.e. you can tell it to use VISTA but you cannot specify architecture (e.g. x64), for example); we forked and modified the original code to support this functionality. Basically we are using a capability called applicationName to pinpoint the exact node we want to execute our test against. See examples section for more details. To execute the scripts use any of the above tools to “Schedule” and “Run” at specific times the automated test suite. The script logic is designed to iterate through a list of browsers and platforms and execute the test against each, see here for an example. 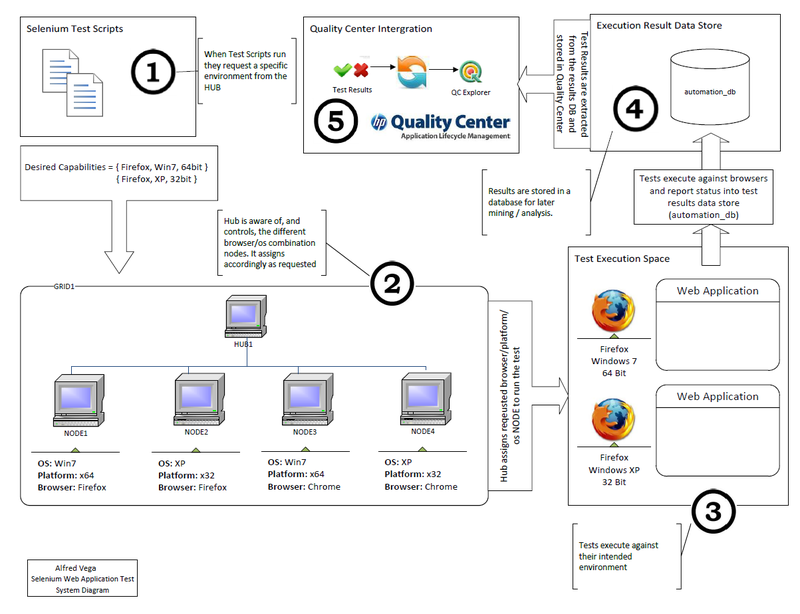 Integration with Quality Center is accomplished using the HP Quality Center Open Test Architecture. OTA is a COM API exposed by Quality Center to facilitate integration with third party (from QC’s perspective) tools. It also enables developers to code custom applications to interface with QC. As an example the QCExplorer application uses the same API. Let us know via email or comment any feedback you may have. As well, if you'd like for us to design a custom automated testing framework for Web or Client applications, please let us know.